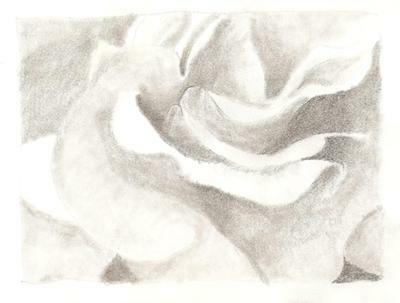 This little drawing took me a few hours to complete even though the size is quite small at 3x5 inches. The reason for all the time was due to my starting very lightly and I kept on building up the dark areas. Recently I purchased a box of six sketching pencils with varying hardness. Most of them were used in this drawing at least a little. Next time I'll experiment more with mixing the pencils and amount of pressing on the paper because it seems like the mix of pencils did not go on the paper all the same. The shading was done with a pencil stump. Join in and write your own page! It's easy to do. How? Simply click here to return to Drawing.